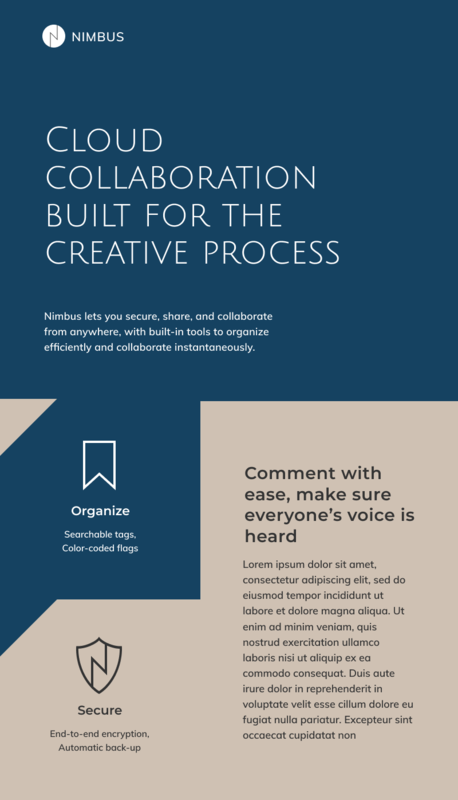 Nimbus is a cloud collaboration platform designed with the creative process in mind. 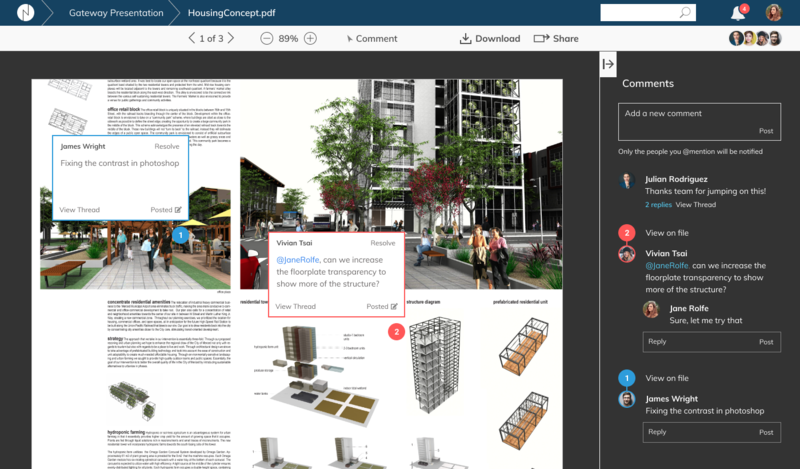 The goal is to combine the best features of a cloud-based document viewer and enhance it with a robust commenting feature that allows for conversation threads, so as to create a more efficient feedback loop for remote teams. 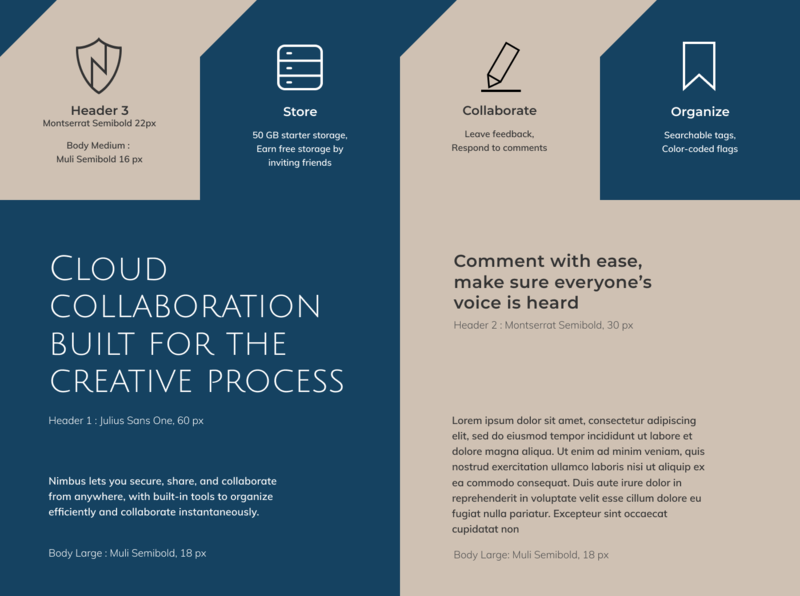 The creative process is iterative in nature, it thrives on an efficient feedback system as well as an effective organization method that enhance rather than hinder the creative workflow. 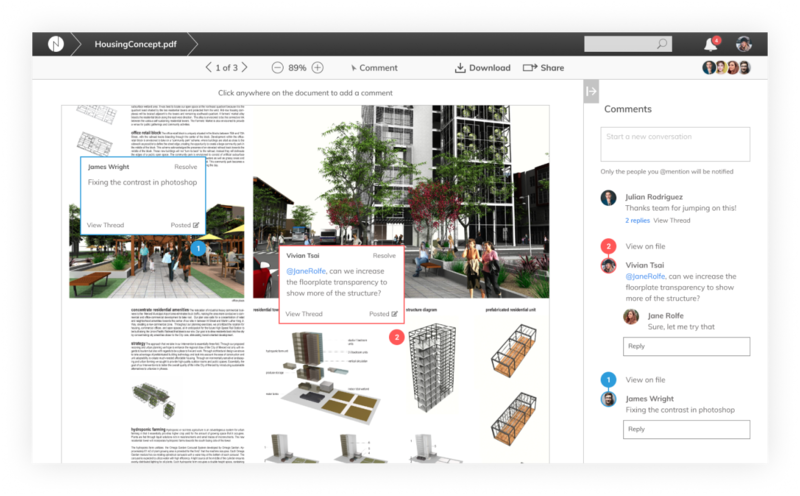 Currently, the creative community is hard-pressed to find a cloud collaboration platform that combines robust commenting features with advanced file organization capabilities. On one end: Platforms with great organizational features, but with limited communication features. On the other end: platforms with great communication features, but inflexible organization features. 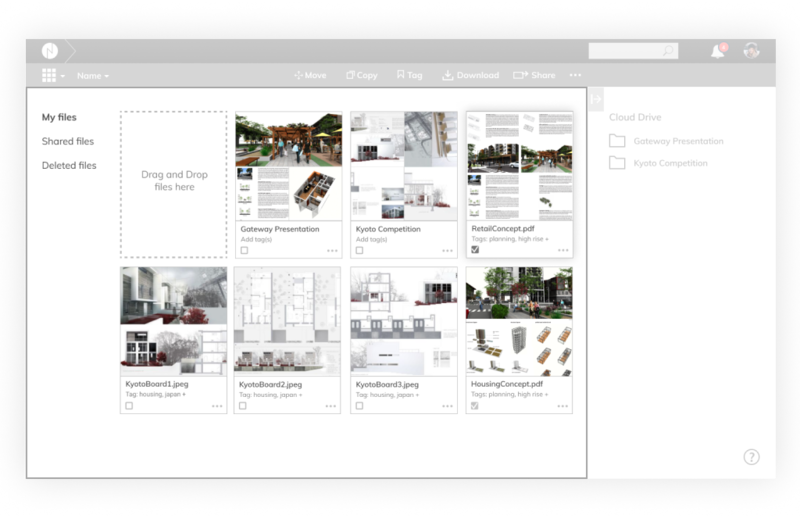 Platforms such as Evernote may have great organization capabilities (i.e. searchable tags), but they are lacking in commenting features that facilitate efficient feedback. 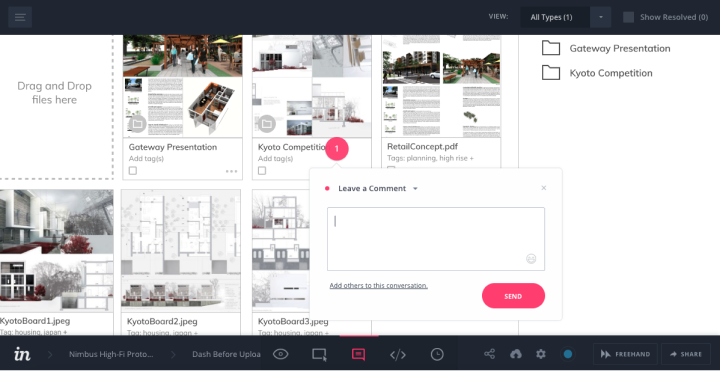 Platforms such as Dropbox, InVision, and RedPen have powerful commenting features, but their file organization capabilities lack flexibility, restricting users to organize by nested folders. 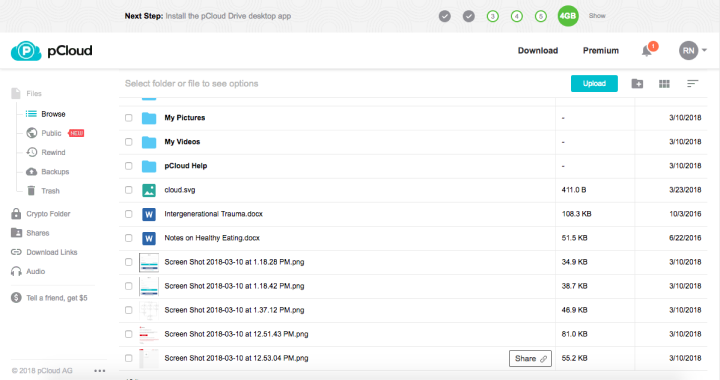 I conducted a competitive analysis between four leading platforms such as Dropbox, Mega.nz, MediaFire, and pCloud. 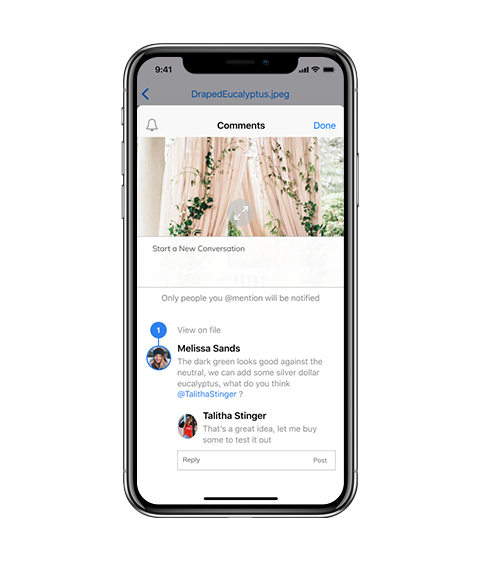 I identified a growing trend towards more advanced commenting features that allow users to track conversation histories in their shared documents. As I studied the competition, I was fascinated by the use of vertical versus horizontal toolbars. 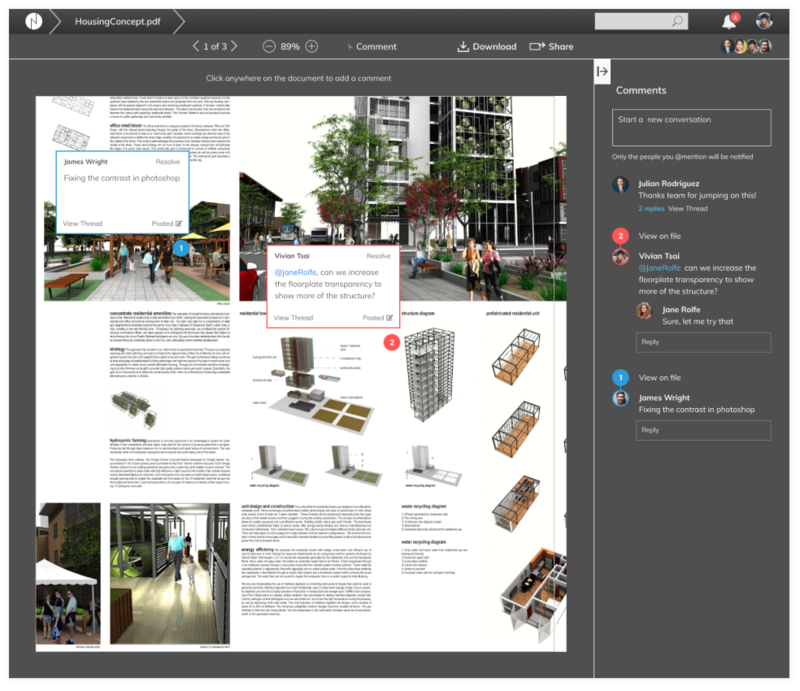 I also identified similarities, such as the tendency to put location-based links along the left-aligned toolbar pane. 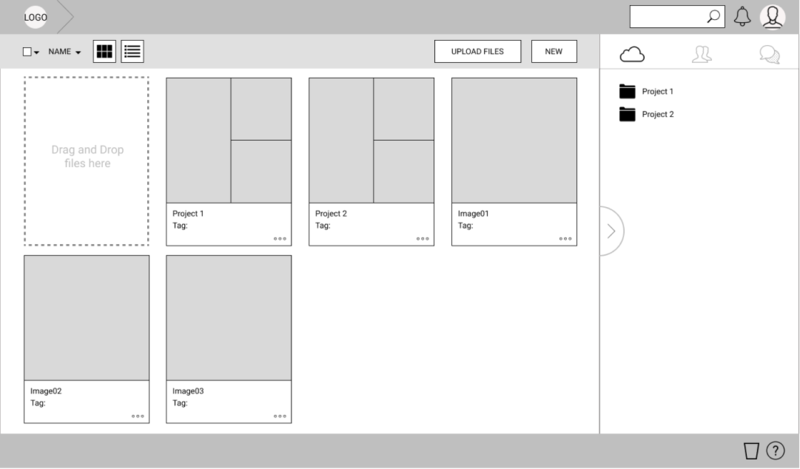 After scrutinizing the layout and navigation structure of several cloud platforms, I synthesized my research into a series of user flows and wireframes that begin to inform the layout of key elements of the user interface. 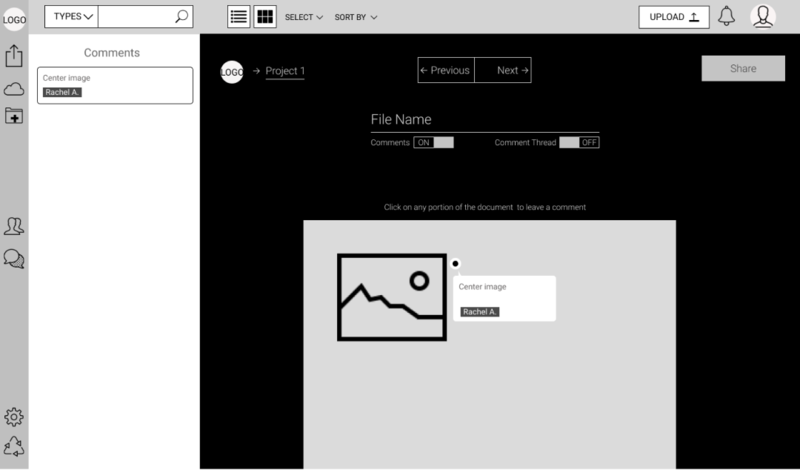 I constructed a series early wireframes that were inspired by cloud storage platforms I analyzed during the competitive analysis phase of the project. I tested a vertical toolbar layout that was utilized by Mega and MediaFire. 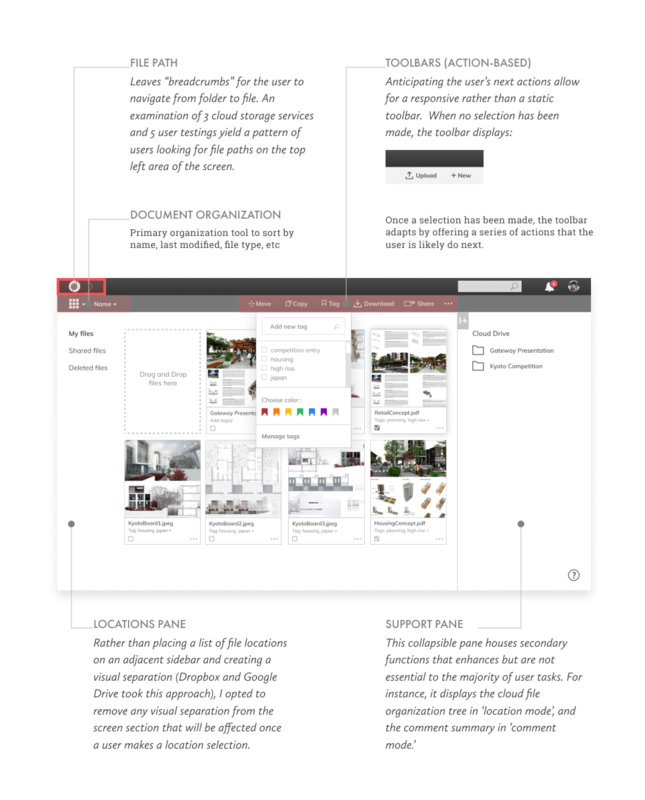 I also tested a horizontal toolbar layouts that platforms such as InVision, Dropbox, and Redpen utilized. 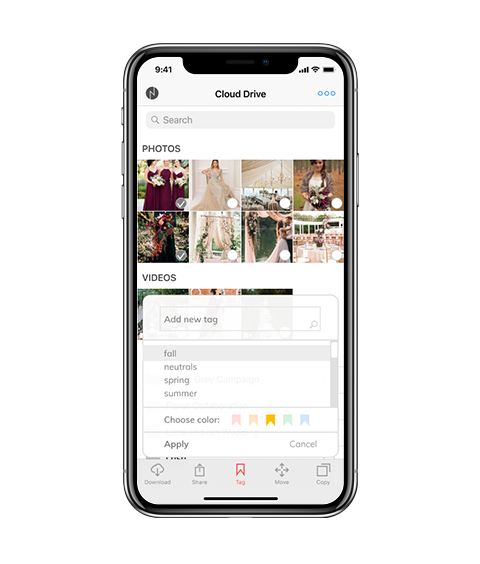 This initial round revealed that users do not look for high-use functions like ‘upload’ along the bottom navigation bar. They expect it at the top bar or somewhere along the top half of the screen. I learned that icons mean different things to different people, and that labeling a button by text is necessary for user comprehension. I also learned the importance of locating file paths ("breadcrumbing") on the top portion of the screen. On this round, I learned that most users do not connect clicking a button in one location that affects the changes in another area of the screen. To them, it is as if their action does not generate a response and it becomes a frustrating experience to use the dashboard. 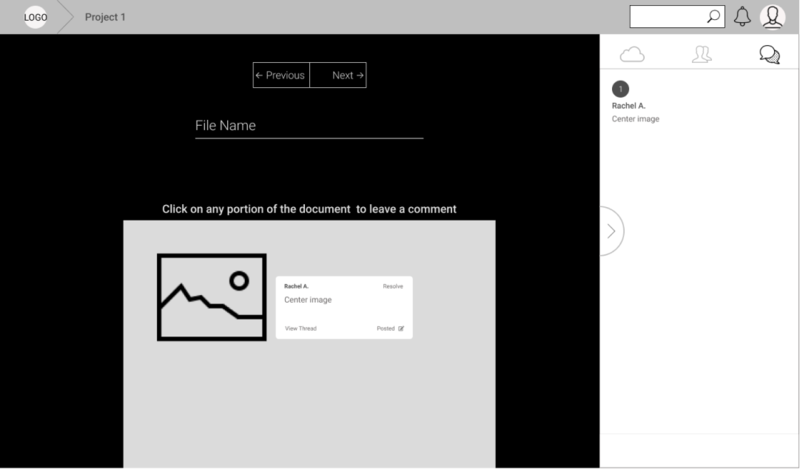 Consistent with the gestalt principle of proximity, it is best to put icons and functions on the same location as the pane or section of the dashboard that it affects. 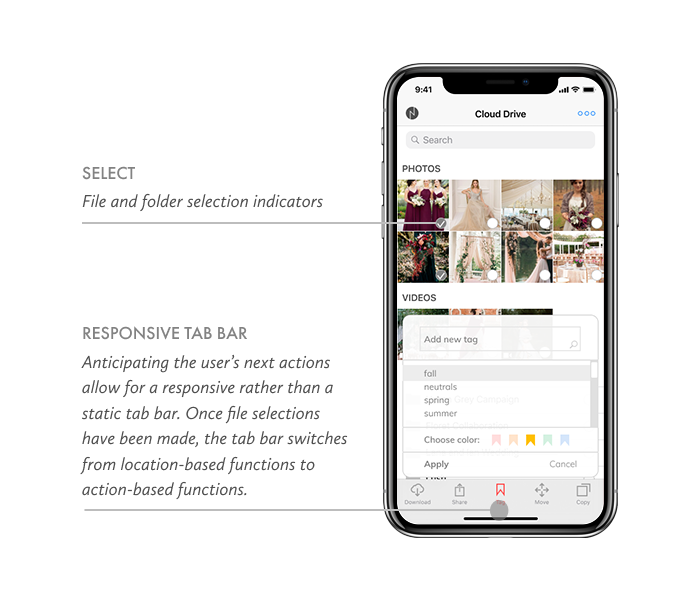 After scrutinizing the layout and navigation structure of several cloud platforms and validating design decisions through several rounds of user-testing, a clean dashboard design with a top horizontal toolbar and a right-aligned support pane prove to be the most effective. 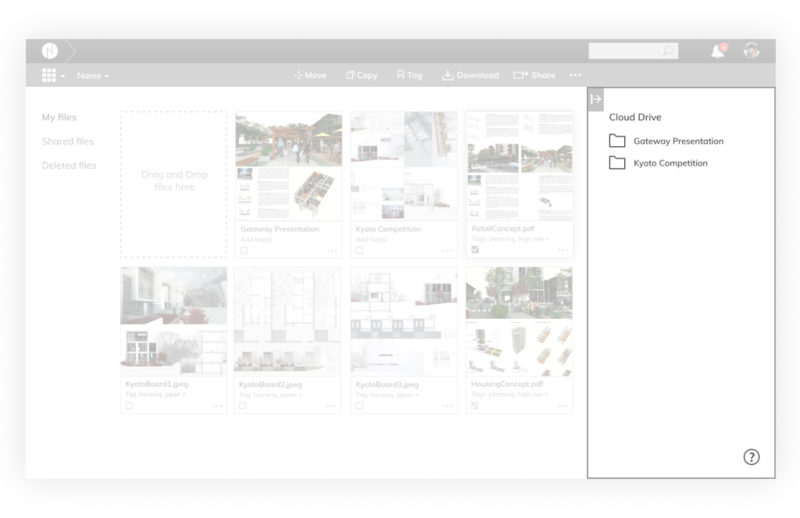 Breadcrumbing as a primary navigation tool is essential in a file organization software whose files can be buried several levels deep within folders. 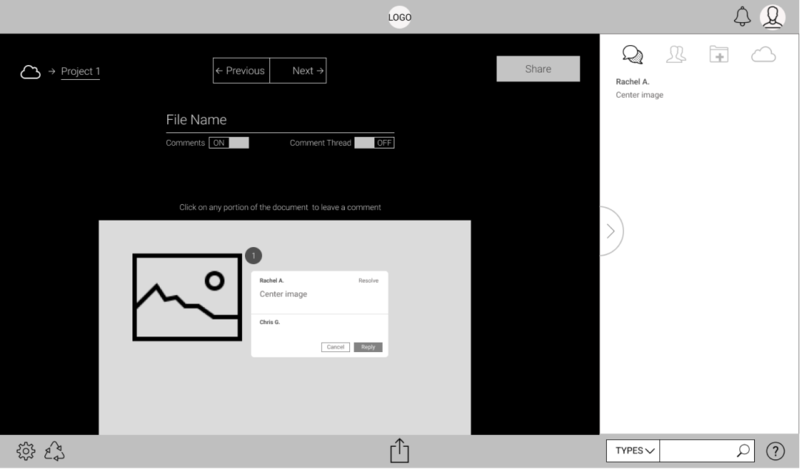 User tests reveal that the optimal location for file paths is at the top left portion of the screen. Anticipating the user’s next actions allow for a responsive rather than a static set of toolbars. 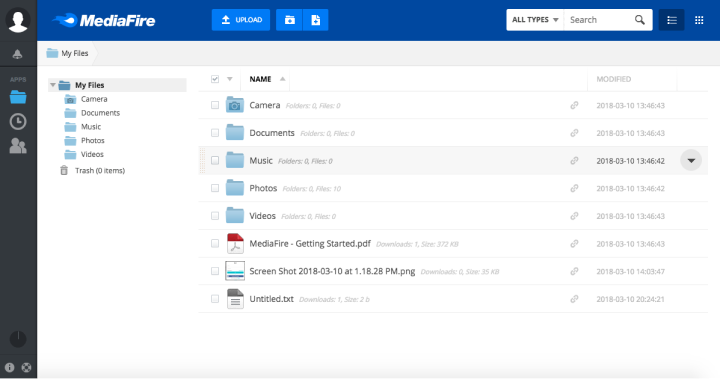 If the user has not made any file selections, then they are likely to upload or create a new folder. 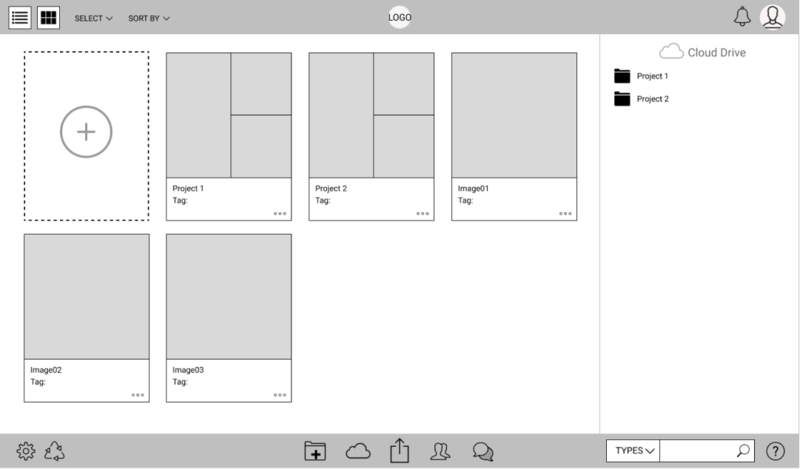 Once file selections have been made, the tab bar switches to a series of functions that the user is likely to want to do next. Frequently-visited locations are located along the left edge of the dashboard. 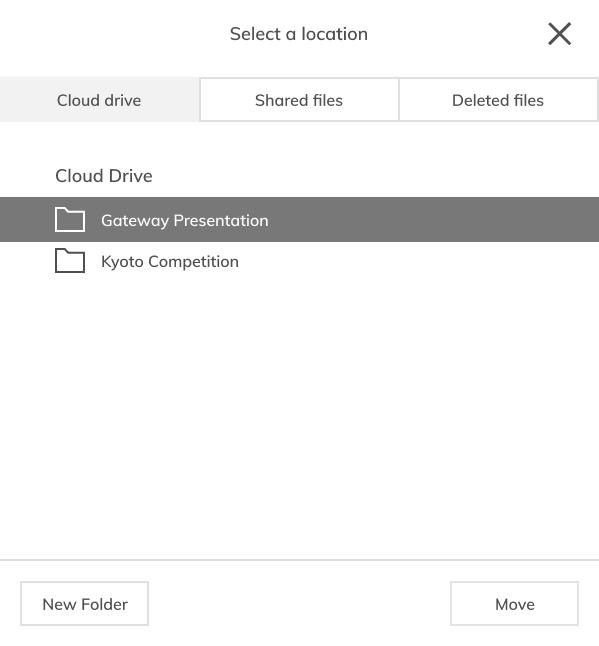 Rather than placing a list of file locations on an adjacent sidebar and creating a visual separation (Dropbox and Google Drive took this approach), I opted to remove any visual separation from the screen section that will be affected once a user makes a location selection. 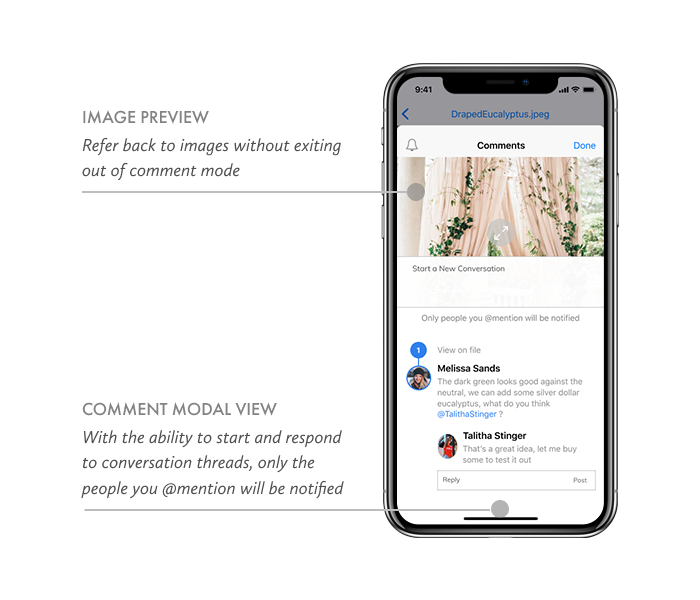 I conducted a competitive analysis between four leading platforms and identified a growing trend towards more advanced commenting features that allow users to track conversation histories in their shared documents. 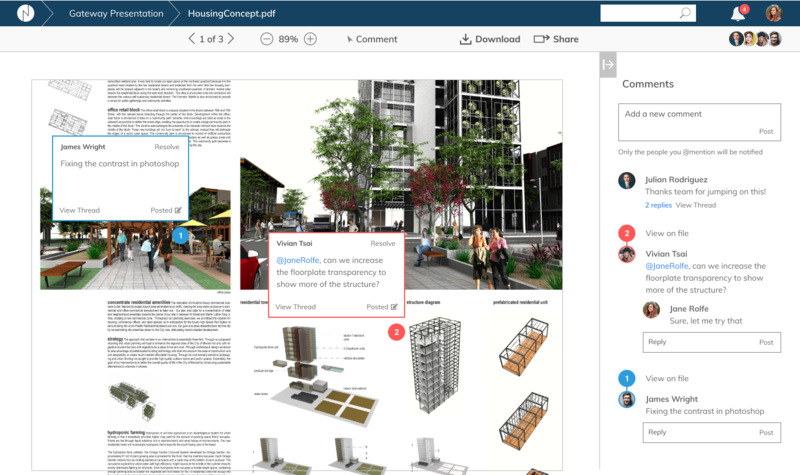 Users can choose between commenting on specific document locations, or starting general conversations that apply to the entire document. I came up with dark and light UI versions of the dashboard. 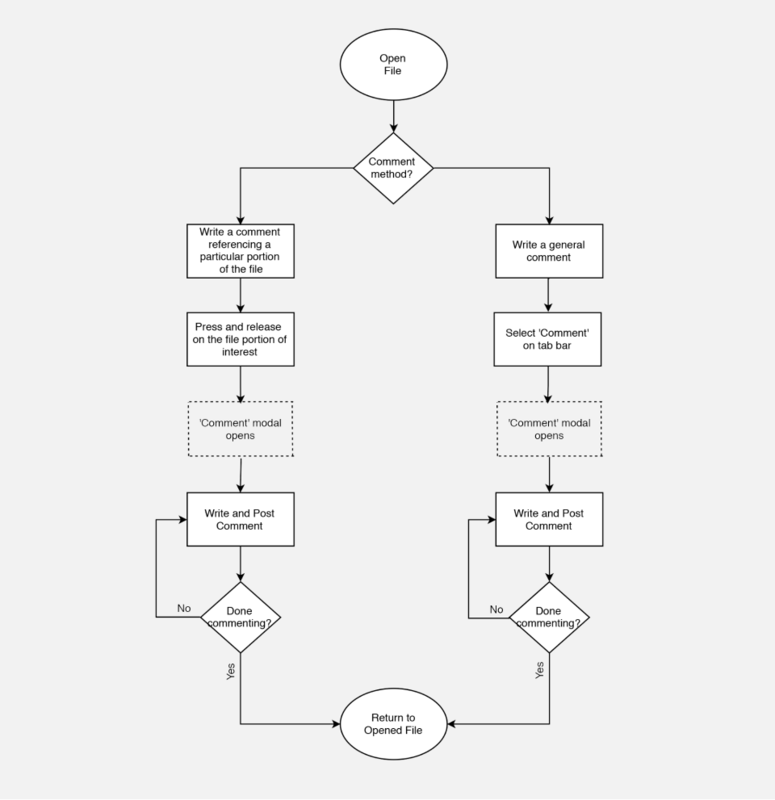 Both were equally interesting, so I conducted a preference test to select a UI theme direction. 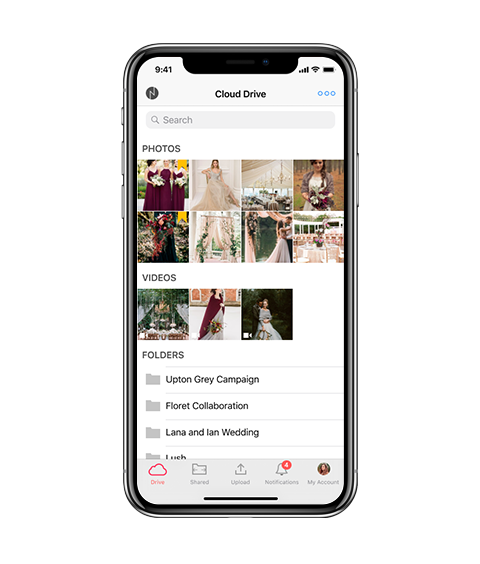 As an extension of the desktop counterpart, the Nimbus mobile app is designed to give users the same powerful organization and collaboration features that the Nimbus desktop counterpart offers. The concept of the responsive toolbar translates into a responsive set of tab bars. 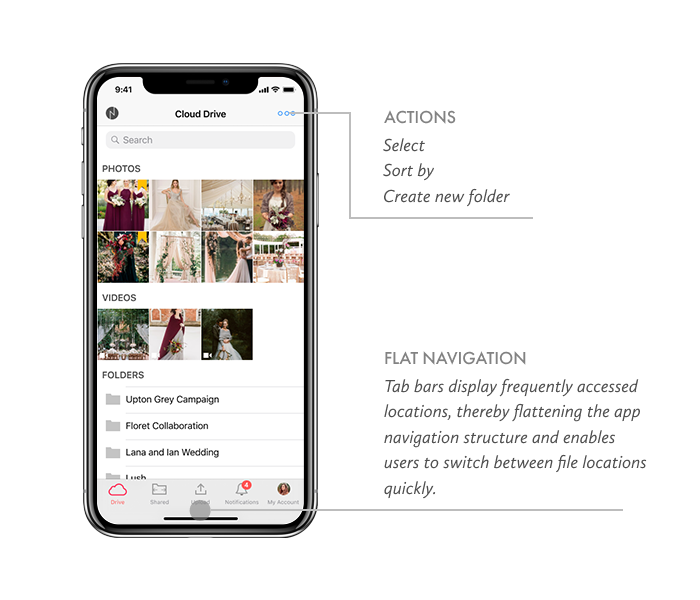 When loading the app, the tab bars display frequently-accessed locations—thereby flattening the app structure. Anticipating the user’s next actions allow for a responsive rather than a static tab bar. 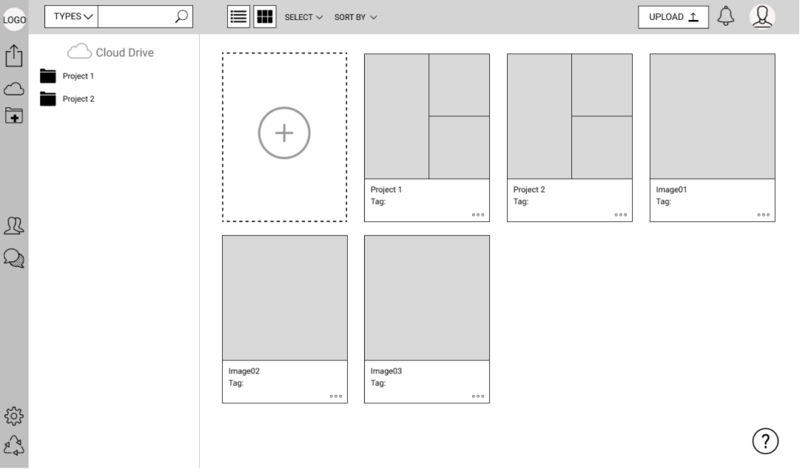 Once file selections have been made, the tab bar switches from location-based functions to action-based functions. 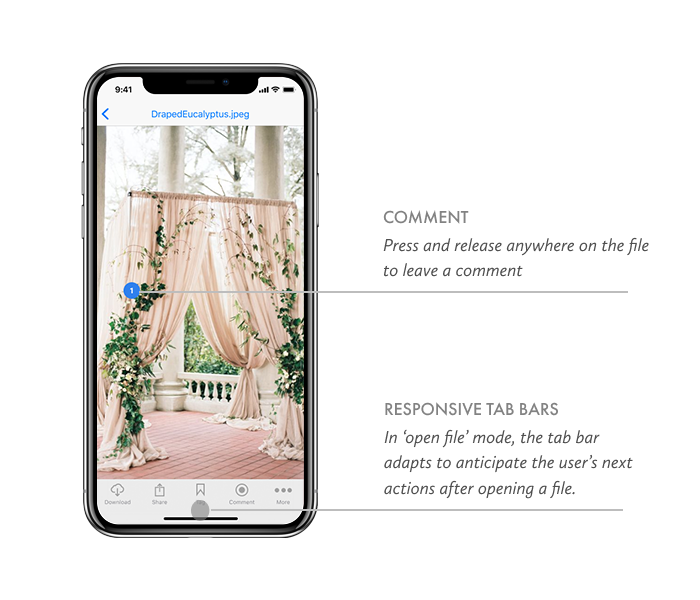 In comment-mode, the tab bar adapts to anticipate the user’s next actions after opening a file. I learned the hard way that icons mean different things to different people, that labeling a button by text clarifies it that much more for the user. 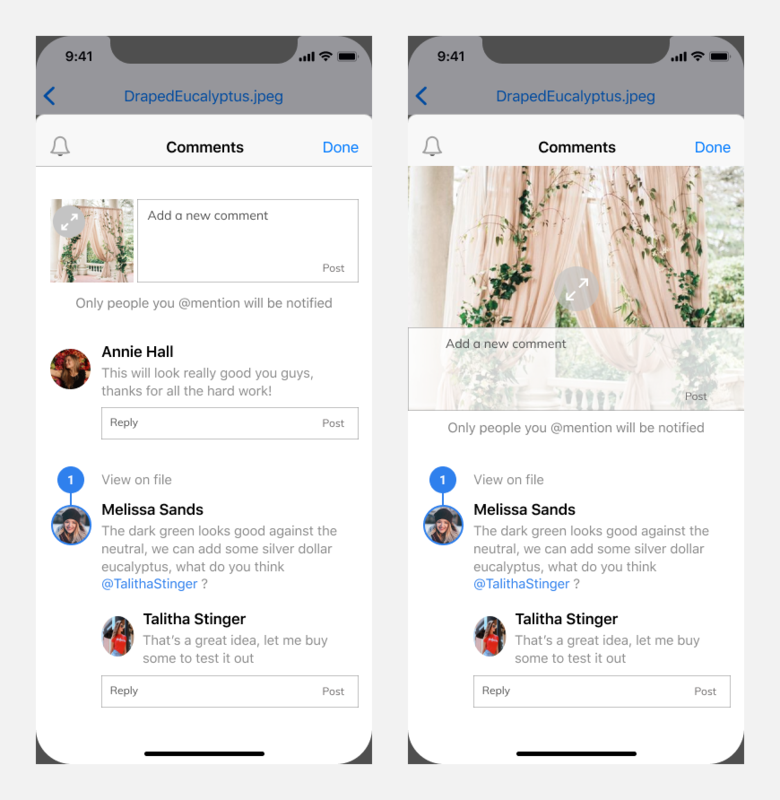 As I watched people struggle with knowing where to click next when leaving a comment, I learned the importance of visual responsiveness to a user’s action. 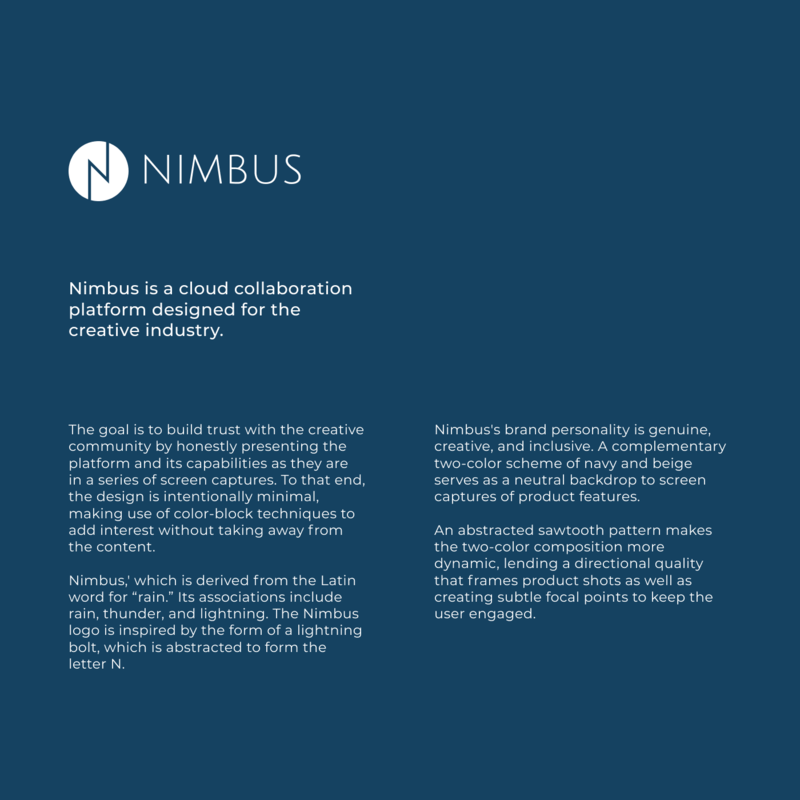 The cloud platform is named after the cloud formation Nimbus, which derives its name from the Latin word for rain. Its associations include rain, thunder, and lightning. The Nimbus logo is inspired by the form of a lightning bolt, which is abstracted to form the letter N.
Here are a few versions of the logo iterations, ultimately I chose the center one. The brand typeface is Julius Sans One, chosen for the the thin font geometry that echoes the weight of the ‘N’ of the Nimbus logo. The secondary heading font is Montserrat, and the body font is Muli. 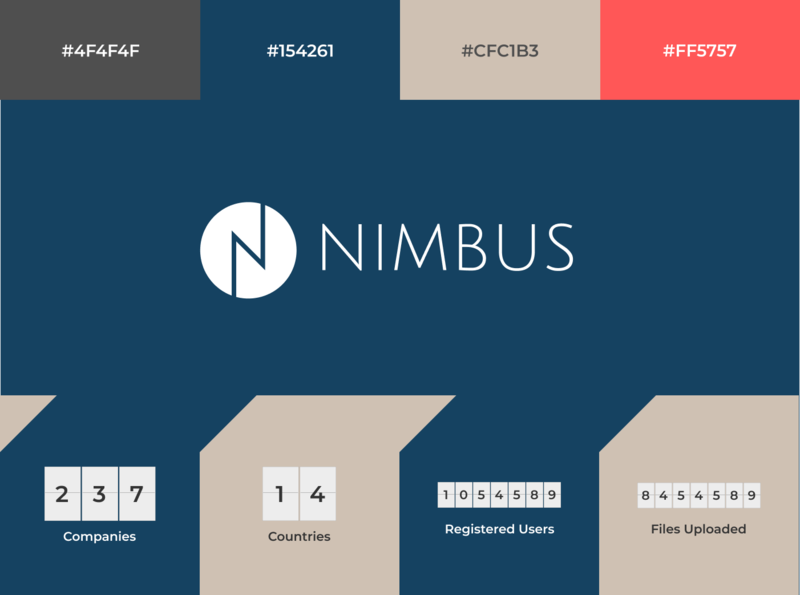 Nimbus's brand personality is genuine, creative, and inclusive. 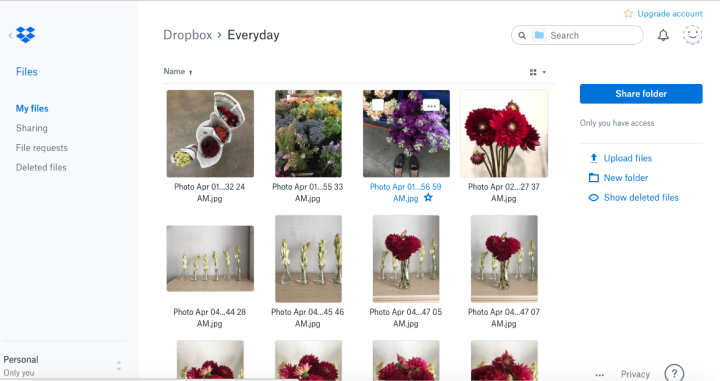 A complementary two-color scheme of navy and beige serves as a neutral backdrop to screen captures of product features. An abstracted sawtooth pattern makes the two-color composition more dynamic, lending a directional quality that frames product shots as well as creating subtle focal points to keep the user engaged. 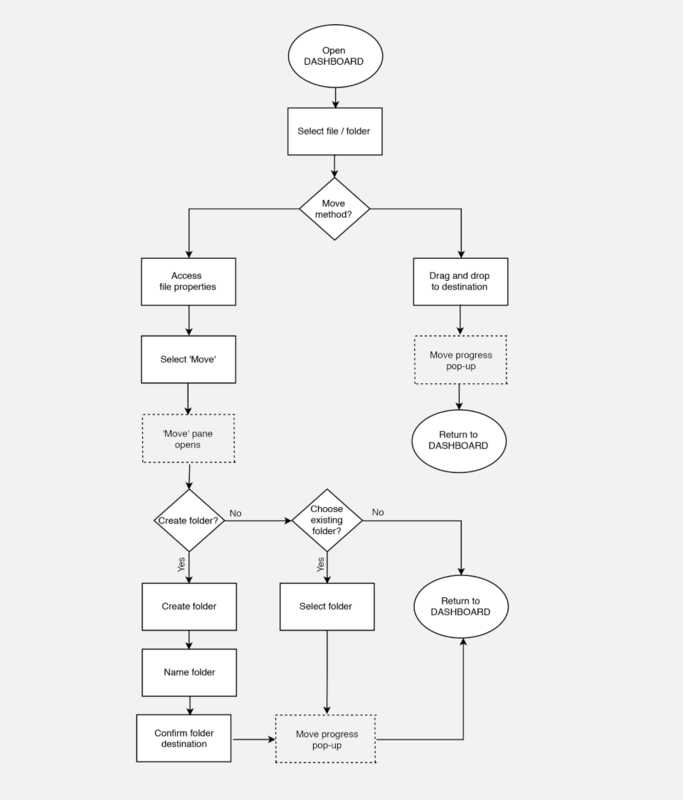 Designing effective landing pages is about creating a clear content hierarchy. I had initially implemented a color-blocked background scheme to add more visual interest to the composition. I then conducted some preference tests to validate the design direction. 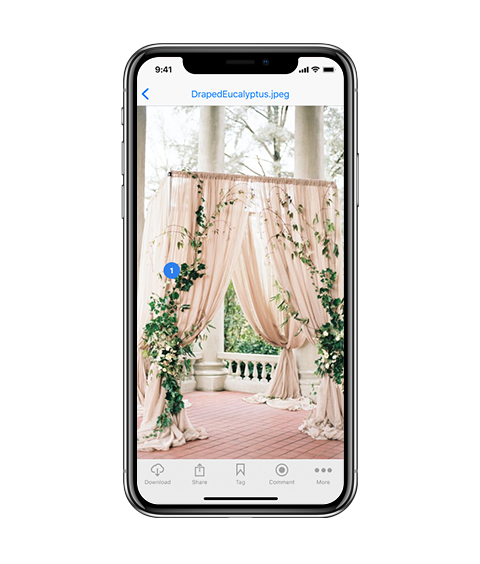 The final design is informed by people's overwhelming preference for clean and simple designs featuring neutral backgrounds that highlight product screen captures.